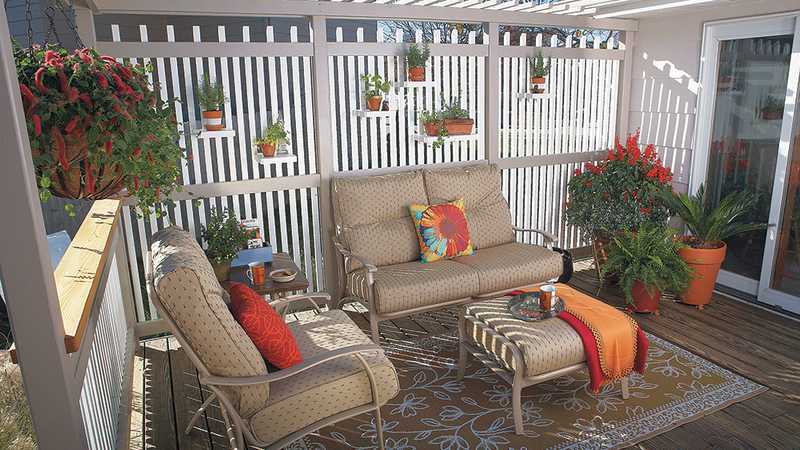 Before you head out to buy outdoor furniture for a deck or patio, take time to think about how you plan to use the space. Like to eat outside? 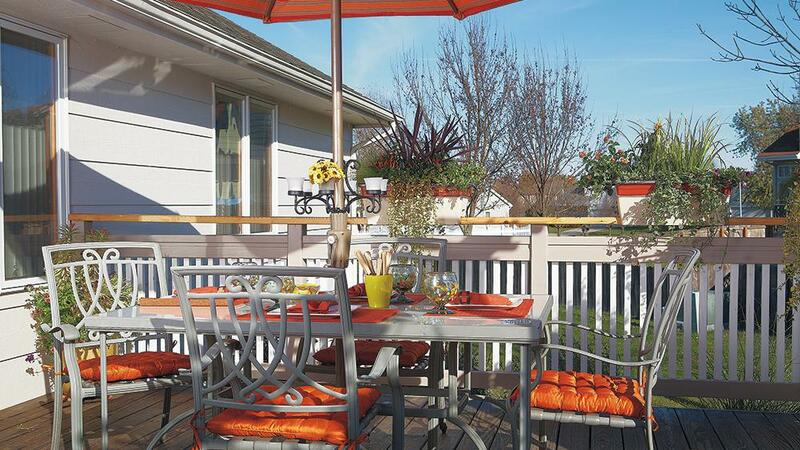 You may want to spend more of your budget, and use more of your space, on a dining table and chairs as we did on this deck. But if you mostly prefer to relax outdoors after dinner, you’ll want more pieces of furniture for lounging. You’ll also want to consider traffic patterns through the space. If you have to walk across the deck or patio to reach the yard, like you do here, leave room to move around the furniture easily (a 4-ft. corridor is ideal). The first thing you need for an outdoor dining area is a table. Give a little thought to the right table shape for your space. Round tables don’t have any sharp corners to run into, and everyone at a round table can see each other easily. And a round table with a pedestal allows you to fit a couple of extra chairs in if you need to. However, a round table that’s more than 4 ft. across is too wide to reach into the center for condiments or serving dishes. Round tables aren’t as efficient a use of space as squares or rectangles, which is why we chose a rectangular table for this comparatively small area. A firm ottoman can double as a coffee table in front of a loveseat or chairs. Although the main focus of this deck makeover was to create an outdoor dining room, that left the other end of the deck a little bare. There’s a natural traffic path from the sliding doors to the steps, so we used the smaller section for casual seating. A reversible rug defines the seating area, as does the fact that the furniture is a slightly different color and style from the dining table. It’s OK to use different styles of furniture on one deck or patio, but make sure that the overall weight and color of furniture is similar — that way, the whole deck feels balanced. Speaking of furniture, people often focus on chairs and loveseats, and forget the smaller pieces like ottomans and side tables. That’s a shame, because the one thing that makes any seating area more comfortable (indoors or out) is having a handy place to set your phone, your drink, your laptop or your book.